Baltistan is a remote and mountainous area with an unpredictable climate. Deforestation has taken its toll in the Hushe Valley and flash-floods occur regularly. Mud slides sweep away large parts of villages, destroying families, homes and crops. Survivors face a grim future without food for the winter. When this happens, the FFB mobilises to support the affected communities, not only providing emergency relief but also long-term support to rebuild homes and lives. 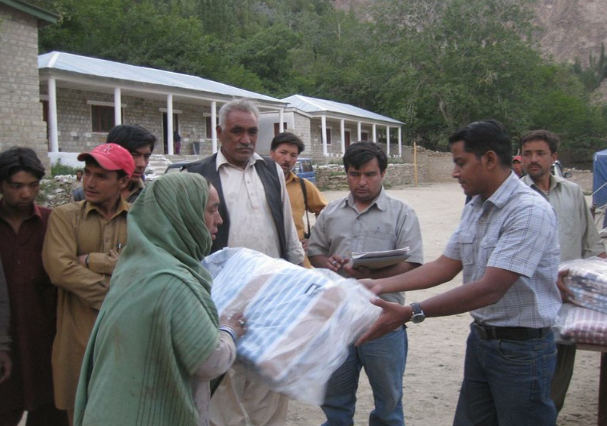 In 2010 a major mud-slide devastated parts of the village of Talis, the FFB provided tents, food and medical aid in the days after the disaster. A project to rebuild homes was begun, relocating families to safer areas away from the mountain river that divided the village. In 2011 a second, bigger, mud-slide hit the village destroying more houses and making 35 families homeless. Again, the FFB was the first organisation to reach the affected area and supply aid.